I saw this page too and tried logging in. The service name – i.e. the one that appears in the login URL * – is "gbase". Got some more screenshots, Tony? No, I was too dumb to take any I'm afraid. I was able to take a few (2) screen-shots but the login system was broken. And what is this: googlebase.com/ and googlebase.fr/ ? Wouter found googlebase.com as well (it currently redirects to the Google main page). 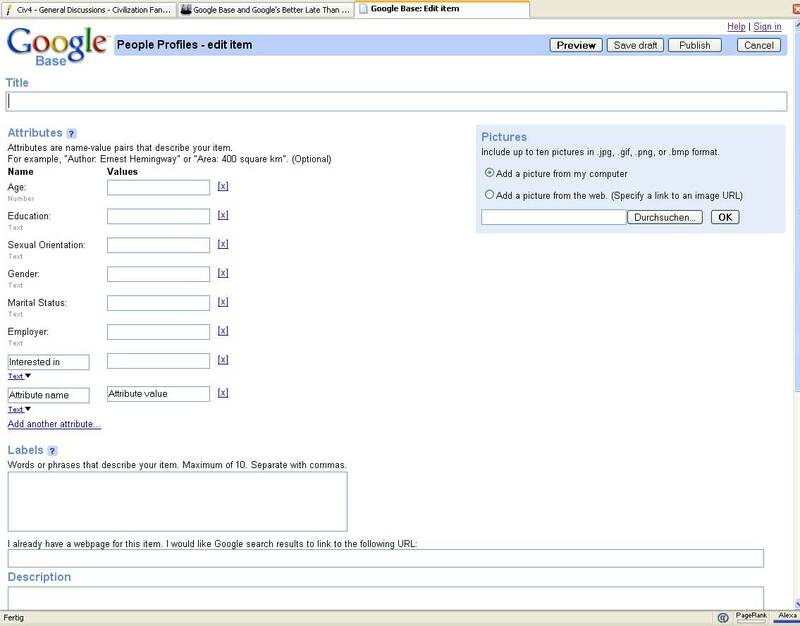 It seems that www.googlebase.com is just a CNAME for www.google.com (like many of Google's extra domains) and was registered back on the 8th June 2005! "This new tool will be introduced during the 'Google Zeitgeist'05 Partner Forum'** to be held today at Google HQ in California." This sounds really big. And I'm not talking about something like GoogleSQL although I personally would really like to see that one. No, think about it: How many websites are not much more than really big databases? eBay. Craigslist. Mobile.de. Google could be competing with all of them at once. Combine Google Base, the fact that Google Base content will show up in the search results and the upcoming "Google Wallet" and what you get might be serious trouble for some large companies. I'm really curious if they offer a Gbase API so I can store my data at their place, but show it with my own layout templates on my own domain. Also, it would absolutey need a "keep this data private" flag for certain databases (not for all, certainly, e.g. if I want to sell my car, naturally this information is public)... but from the first looks of it, and the examples Google is giving, it seems as if they're going for public data only? Wouter, you certainly have some prophetic qualities... combined with Tony's Google-sniffers, that has the potential for a lot of scoops. It makes me smile when I think that you two basically predicted Google Base in the forum 1 day *before* it went live. Base + Froogle + Wallet == Yahoo Stores or Amazon Sellers. Maybe google wants to hire me now because my pet-project woovi (which is kinda the same) isn't really going places. (search for 'woovi' on google if you want to know more). First questions first: how easily can it be spammed? I don't notice anywhere that it says "BETA" on that screenshot. Must be a fake! The are building up (or rolling out) decoration interface (TOS, Help, etc) at the moment and far not all links work yet. At the moment there is no BETA indicator. However they can add it any moment before the launch. I'll just erase the 'craigs' and write in a 'googles'. Yep, that sounds just right. This isn't google's way of going live is it? It was the page with content that is mantion in your post and the Login Iframe reported that Google Account requested is not accessible. That's it, I can try to recover things from my browser cache, but it is worthless as it is the same or almost the same at it was on screenshots reported by others. So keep tuned. BTW, is there anybody, who is invited to services.google.com/zeitgeist0 ... ? It's live right now (13:22 CT Tuesday 10/25) – you should be logged into your personalized Google home page, then type base.google.com into your browser and you will be there. Looks to be a generalized system for posting items (text, ads, jobs, merchandise, calendars) on Google. It is live. But it is still a half-baked site. You must log in to publish a record but that is not posible (just like the first time it was live). Owch! This seems like a serious threat to the offerings of 37signals. Still not live for me (and I'm logged into my Google Account). It looks like Gary got an official "google like" statement about Google Base. It's on the SEW Blog. Why does google make projects like this go online before they are ready? I'm sure they've got internal web servers where you can create the whole project and ONLY after that move it to an online server. And on the screenshots we could see that the page wasn't finished yet. 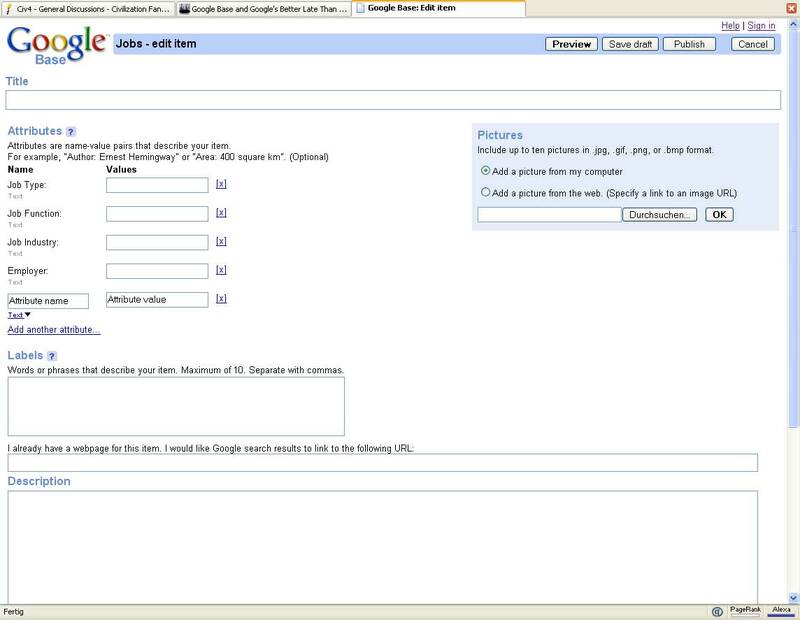 Google Base: A New Rival for eBay and Craigslist? not enough development. Well see. It was pretty much completely live for me a little while ago, but now I get a 403 error. I couldn't get the search engine to work on it at all, but it looks like a serious blow to eBay. I guess at this point you can't auction with it and there's no feedback system. Payment system to come? "Shares of EBay Inc., the world's largest Internet auctioneer, fell as much as 5.6 percent on concern Google Inc. may soon introduce a new feature that allows users to sell products online. Google may use Google Base as a classified ads site, UBS AG analyst Benjamin Schachter said in a report. That would compete with EBay and sites such as Craigslist.com, he said." I still think this all is leading up to a *release* because we are seeing more and more stuff going up. The help page has nice screenshots (official ones) by the way. I dont think this is a direct hit against ebay. auction listing is only a small part, and there doesnt seem to be any planned payment system besides maybe google wallet, which they have already stated wont compete directly with paypal. i think its more like the google grid from the epic 2014 animation. xml driven, so you name attributes and then their values. they will probably wrap in some standard templates for cars, homes, etc., or better yet, let users build and submit the templates. But it kills too many businesses. There are tons of websites will go out of business because of that. The new rule will be pay Google or die. No more classifieds or other services, Google becomes a centerpiece for everything. Right now its already the case: pay Google or your business will not be found. And with Google Base it goes one step further to the world of no diversity, Google controls it all. Too bad that such a nice company is growing into the Big Brother crashing everything and everyone on the way. My acct info has that entry too even though i've never successfully logged in....weird. It looks to me like a logical extension of Froogle. Also if you look at Froogle it recently changed within the last few days to a different format and includes some ratings apparently pulled from other merchant rating services and price groupings it lacked before. 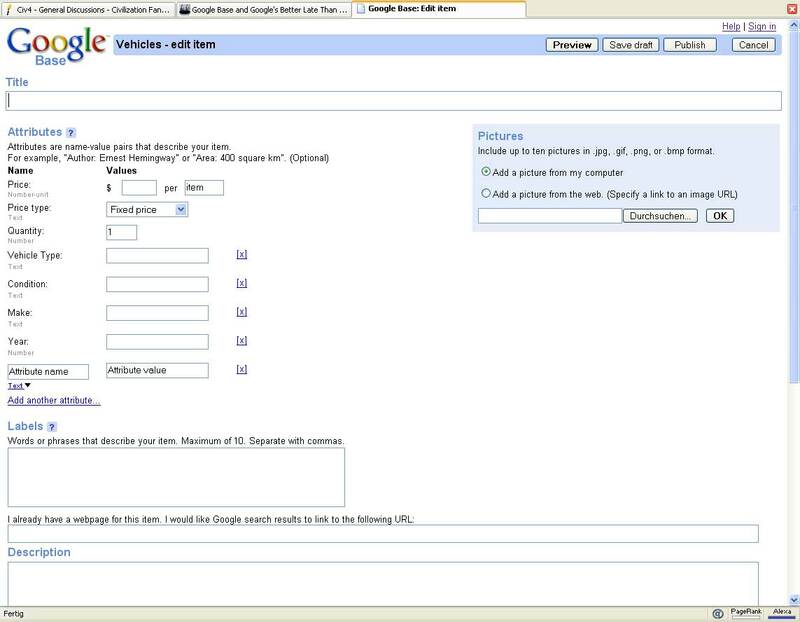 And the current page now says that items may get listed in Froogle. Some of the articles talking about this being a classified service or taking on Ebay suggested that the ratings part of Ebay is one aspect they need to tackle. It looks like they jump started that in Froogle by pulling ratings from 3rd party rating services at least for some merchants, and oddly enough one of those merchants showed twice on a product search I did in Froogle, one with ratings and one saying no ratings. Other articles talk about Google possibly taking on PayPal, and offering the listings services for free. I'm excited. As a small merchant Google has done more for me than any other company to bring customers to my site and at reasonable or free cost to me. I think all your Google Base, Base belong to us. This new Google Base concept looks very similar to ROR – rorweb.com – the XML format promoting "structured indexing" of web content. "creating a new GoogleSQL" I see this speculation as ridiculous. Once they release an API to their database with which you can include the content on your own site, it might not be as ridiculous. However, I can't say if that'll ever happen. the reality is that online markets are natural monopolies anyway. i'd rather have a company like Google coordinating the masses (hello! for free) than eBay. i suspect it will co-exist more peacefully with craigslist than other seller sites. It's live, no one can login though. Pretty useless as of now. It's live now, just tried it and everything works! Today, June 1, 2006, I tried to log into my Froogle account. Google says it was converted to Google Base. NONE OF THE LINKS TO LOGIN WORK!!! I get a 403 error. Google can afford to quality check everything before launching. What gives? It's back! I get 403 also. They shut off my Froogle account, force me to make changes and I can't even login? A little notice wouldv'e been nice – theyv'e got my email address as a registered merchant. Google, get with it. This is not acceptable free or otherwise.